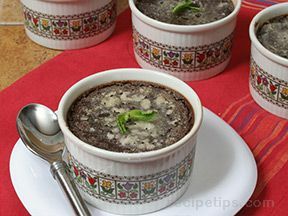 There is a little chocolate surprise when you spoon into this rich creme brulee dessert. 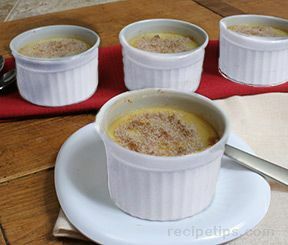 A creamy custard-like dessert, creme brulee is a perfect ending to any special dinner party. 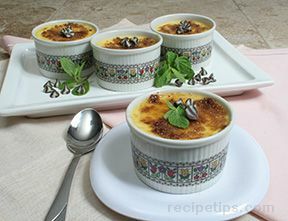 See tips and advice on how to make creme brulee. Divide chocolate chips among 6 ramekins or cups. Heat cream and 1 teaspoon vanilla, stirring or whisking several times. Heat on medium heat for 20 minutes, being sure NOT to boil. In medium bowl, whisk together eggs and sugar until frothy. When frothy, continue whisking and add in a steady stream of the heated cream. Whisk to combine and pour back into saucepan. Cook over low heat, stirring constantly until thick enough to coat the back of a spoon. This takes some time, about 30 minutes. Stir in another teaspoon vanilla. Divide mixture among ramekins, pouring over chocolate chips. 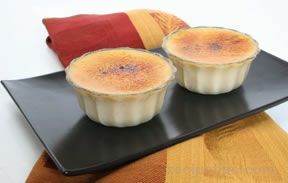 Set ramekins in a baking dish with 2" sides. Fill dish with hot water half way up sides of ramekins. Bake in oven at 350° F for 25-30 minutes, just until custard is set. Let cool, then cover and chill for 3 hours. Just before serving, sprinkle brown sugar over each one and broil in the oven under low heat until sugar carmelizes. Garnish with mint and chocolate chips. Serve and enjoy! "To many problems with this recipe to list. I would recommend finding a different one."